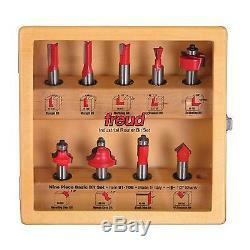 Freud 91-108 9 Piece Basic Bit Set (1/2-inch Shank) with Shadow Box Case. 91-108 9 Piece Basic Bit Set (1/2 Shank). Freud Router Bits are known for their exceptional quality, unmatched precision, and maximum cutting life. The bits are carefully crafted using the best materials, the industry's most sophisticated manufacturing processes, and include exclusive Freud features such as TiCo Hi-Density Carbide and red Perma-SHIELD non-stick coating. This set includes a variety of bits that allow you to experience several router functions. Set comes in a unique shadow box case that can hang on the wall or mount on the bench to keep bits handy and safe. Cuts all composition materials, plywoods, hardwoods, and softwoods. Use on hand-held and table-mounted portable routers. 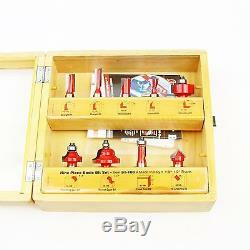 Ideal starter set for the beginning woodworker. Retail store pricing may differ from online pricing. International Buyers - Please Note. Unless otherwise specified, all items that plug into an outlet are 110v. Australia / New Zealand / Israel. Hardware Sales is not responsible for service transit time. This information is provided by the carrier and excludes weekends and holidays. Note that transit times may vary, particularly during peak periods. 91-108I Standard Listing - 03 MGT0504. The item "Freud 91-108 9 Piece Basic Bit Set (1/2-inch Shank) with Shadow Box Case" is in sale since Friday, April 14, 2017. 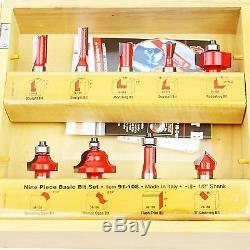 This item is in the category "Home & Garden\Tools & Workshop Equipment\Power Tools\Router Bits". The seller is "hardware_sales_inc" and is located in Ferndale, Washington. This item can be shipped to United States, all countries in Europe, Canada, Australia, Japan, China, South Korea, Indonesia, Taiwan, South africa, Thailand, Hong Kong, Bahamas, Israel, Mexico, New Zealand, Philippines, Singapore, Saudi arabia, United arab emirates, Qatar, Kuwait, Bahrain, Malaysia, Brazil, Chile, Colombia, Costa rica, Dominican republic, Panama, Trinidad and tobago, Guatemala, El salvador, Honduras, Jamaica, Antigua and barbuda, Aruba, Belize, Dominica, Grenada, Saint kitts and nevis, Saint lucia, Montserrat, Turks and caicos islands, Barbados, Bangladesh, Bermuda, Brunei darussalam, Bolivia, Ecuador, Egypt, French guiana, Guadeloupe, Jordan, Cambodia, Cayman islands, Sri lanka, Macao, Martinique, Maldives, Nicaragua, Oman, Peru, Pakistan, Paraguay, Reunion, Viet nam, Uruguay.